The South Green Historic District was added to the National Register of Historic Places in 1980. The proposal was submitted by Margaret E. Welden for the Ipswich Historical Commission and is copied below. 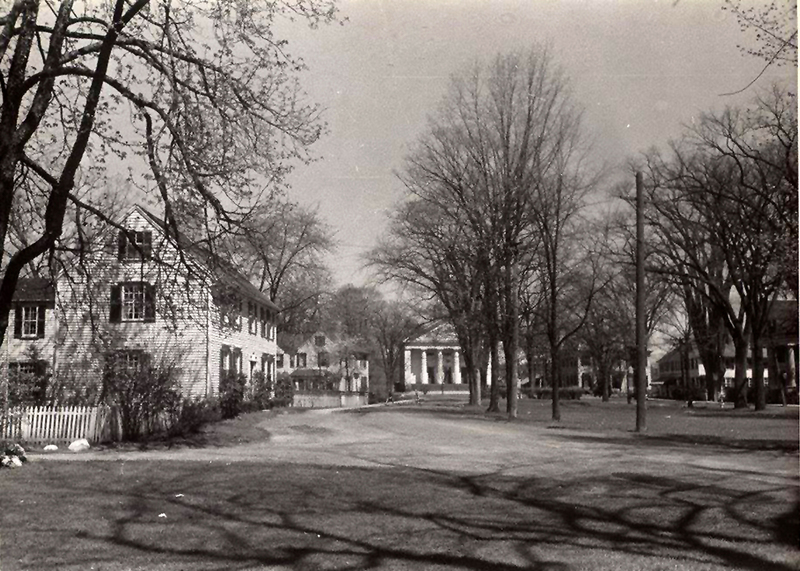 The South Green dates from 1686, when the town voted that the area be held in common, and it has fulfilled various community needs. Cattle were gathered here to be driven to outlying pastures. 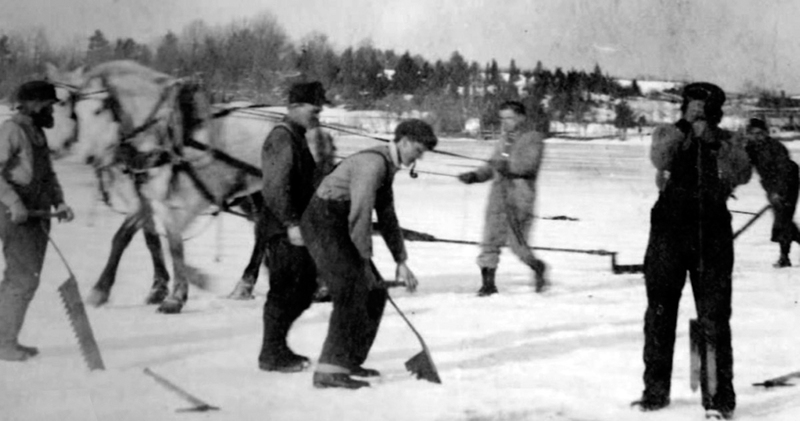 All adult men reported monthly to the Green for military training. 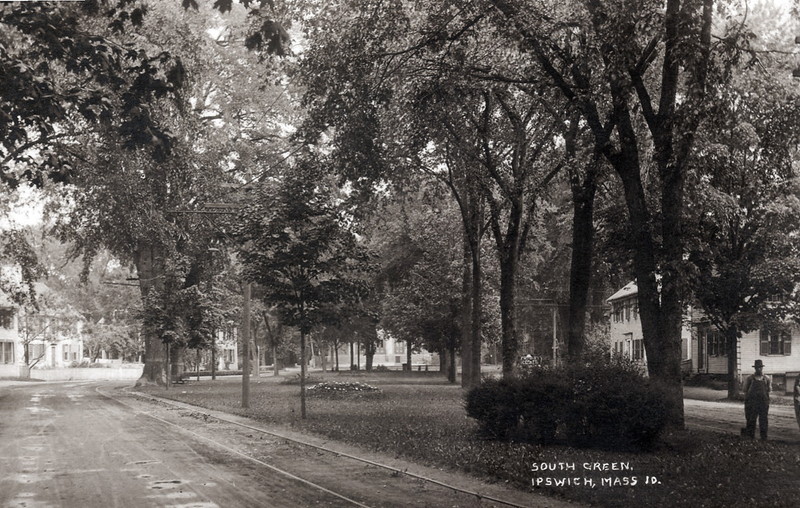 Above all, the South Green was the educational center of Ipswich. In fact, it was first known as the School House Green. As early as 1636 a Grammar School was established in Town. Ezekiel Cheever, famous New England educator, came to Ipswich in 1650 as schoolmaster. The first schoolhouse was built on the corner of Poplar and County Road. by 1652 and Cheever taught there until 1660. The Grammar School remained in this location until 1704, when it was moved to the new Town House on Meeting-House Green. In the mid-18th century Madam Rogers, wife of Samuel Rogers, kept a school for young ladies in her home at the north end of South Green. In 1794 the Grammar School moved back to the area into a new building on the corner of County and Argilla Roads. From 1828, the South District of town shared the building for its own school, and in 1836 the Grammar School merged with a new English High School. 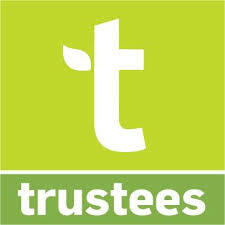 That merger brought radical changes in the scope and purpose of the Grammar School, and many residents marked that date as the passing of the ancient school. The second district school moved to a new building nearby at Payne and Poplar Streets about 1850, and the High School left the old South Green building in 1874. The 1794 Ipswich Payne High School originally sat at the corner of County and Argilla Rds, but was moved a short distance to the corner of Argilla Road an Payne St. after it closed. Today the South Green is no longer the educational center of Ipswich. 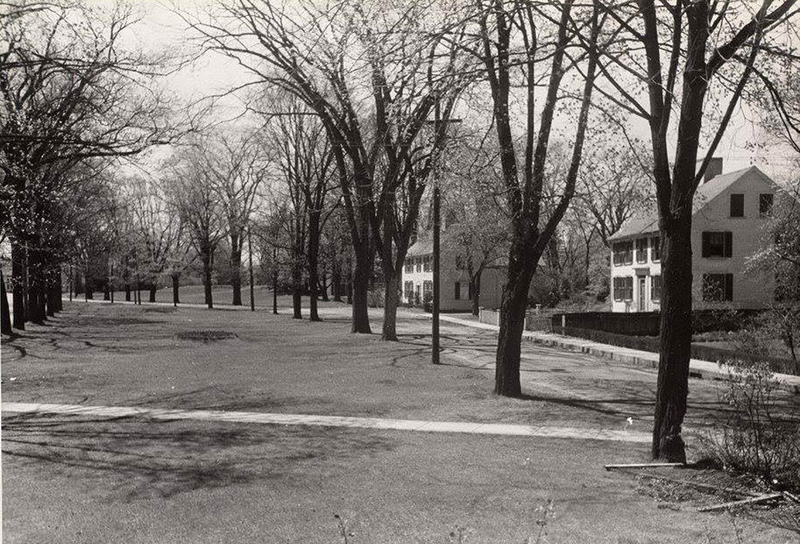 The boundaries of the South Green essentially ware determined when the Green was set aside by the town 300 years ago, and today they remain nearly the same. The Heard House marks the Northwest corner, then the boundary line runs south to Saltonstall Creek, crosses County Rd., then runs north to the Sweeney Tavern, which marks the northeast corner. The line then runs east to the northwest starting point. The boundaries were predetermined by the structures in the area. 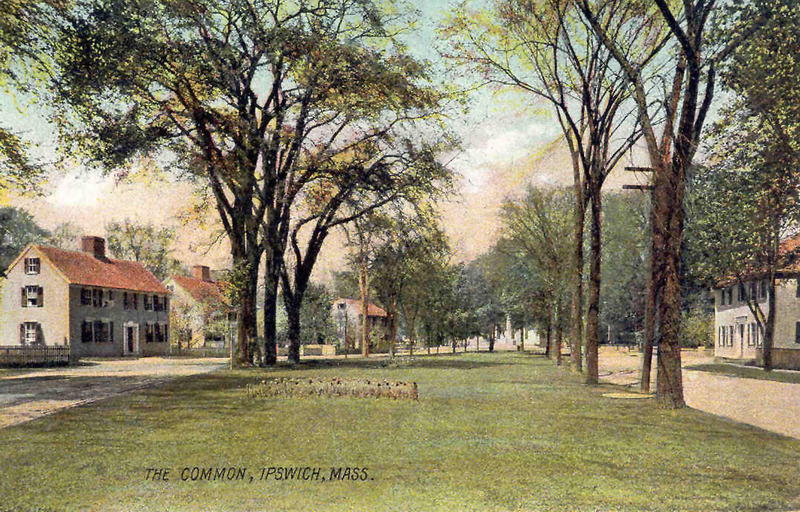 “The South Green is a most fascinating microcosm, the people who lived there and the structures that ring it — 17th Century, Georgian, Federal and Greek Revival — a fragile link to the Ipswich that was — and a nagging and constant reminder of the precious heritage that we have inherited and more times than not, use so carelessly. We remember seeing a picture of the Green, painted about 1840, and being struck by the beauty and complete serenity of the scene. Two riders canter by the house, the lady, ramrod straight in her side-saddle, her feathered hat and elegant skirted riding habit reminding us of a time romantic. Her gentleman companion, faultlessly turned out, wears his fawn riding suit with an air of careless elegance. Down the street, in front of the Giddings house and store on the corner of Argilla Road, two ladies walk arm in arm, deep in conversation. 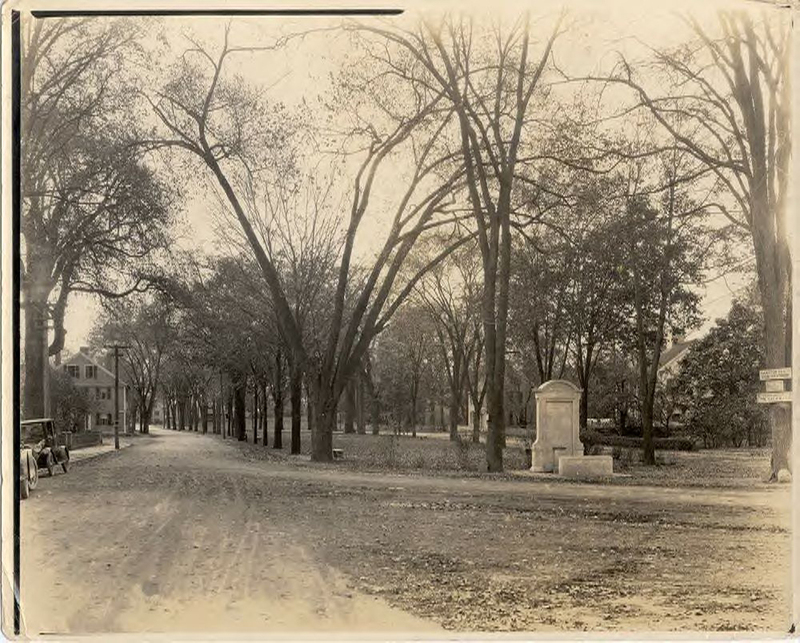 Five enormous elm trees line up on the western side of the Green, and underneath a chaise is being drawn by two sleek horses. And, gleaming ghostly in the background, the focus of the picture — The South Parish House — newly built, columned and pristine, and now gone forever. Here near the Green lived the Rev. Nathaniel Ward, author of “The Body of Liberties” and “The Simpler Cobbler of Agawam,” his house on the east side of the Green. Cotton Mather tells us that Ward had inscribed over his fireplace, “Sobrie, juste, pie,” (soberly, justly, piously) and afterwards added “Laete” (gladly). Close by lived his son-in-law, Dr. Giles Firmin. That famous schoolmaster, Ezekiel Cheever, lived near the corner of Poplar street and kept the school-house nearby. He labored here between 1650 and 1661 before moving on to Boston and its Latin School. The Rev. Nathaniel Rogers, pastor of the First Church from 1638 to 1655, the first of the long line of Rogers to shepherd the Puritan flock, lived to the rear of the Colonel Baker house, “sundry remains” being found when a water line was dug to “the Gables” in 1846. As time passed, more houses were built, the mansion of John Heard in 1799, and the tone of the South Green already established, remained. Augustine Heard always had his eye out to acquire, move or tear down those houses surrounding the Green, already perhaps crumbling, in an effort to enhance and preserve. the park-like setting he so admired. He bought the property of Daniel Cogswell when that 1816 house and store was partially destroyed by fire, moved the store-house from the area adjacent to the present location of the Whipple House, and set it up next to the South Side Cemetery where he put it to use as a barn. 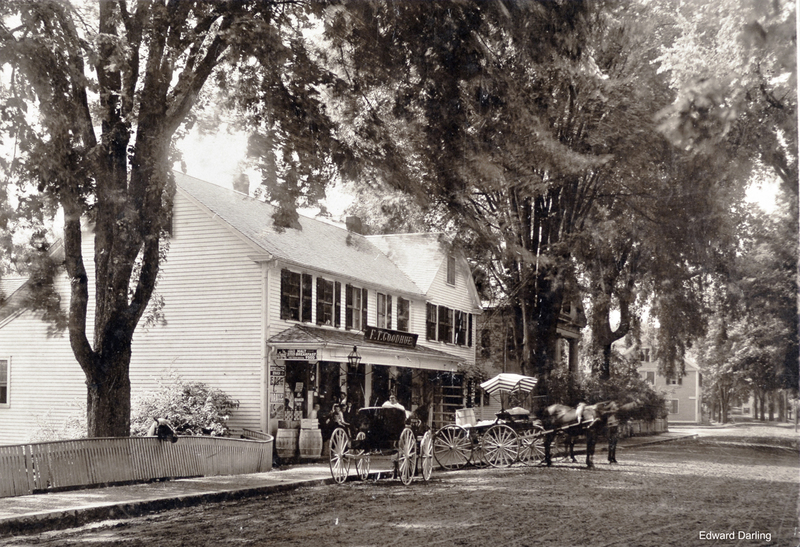 The old Crompton Inn, built in 1693, the favorite stopping off place of Judge Sewall for a helping of “roast fowle”—and later the home of Colonel Choate, the builder of the bridge, was torn down in 1836 and the land sold to Heard. 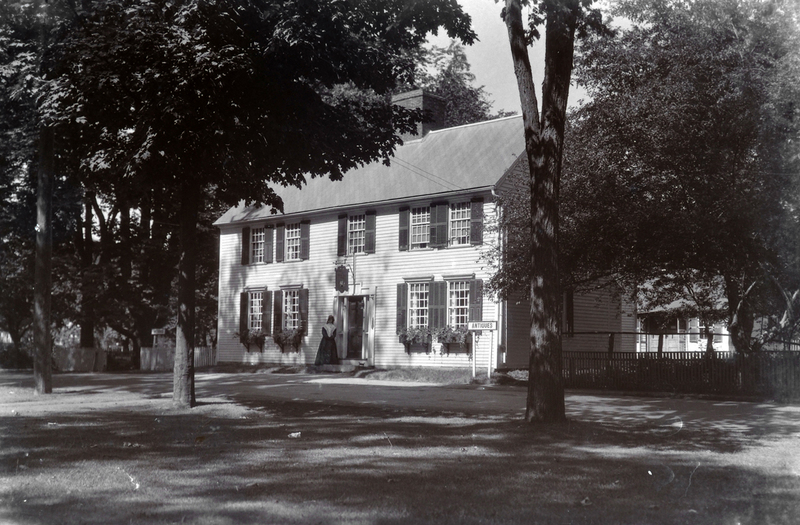 Its neighbor, the 1740 Walley-Dana House that used to sit in front of the Whipple House was bought by the Heritage Trust in the mid-1950’s and taken down. The old house, weak with age, had been eyed by the telephone company as a perfect site for a new office building. Thankfully, the Trust came to the rescue and the area was opened up to reveal the Whipple House in all its glory. The telephone company had to be content with buying another old house further down County Road, moving it to the back of the property and erecting the present telephone building. The Whipple House has been around, too. Originally it stood down on Saltonstall street, and in 1927 it was moved to its present location — the land the generous gift of the Crane family. 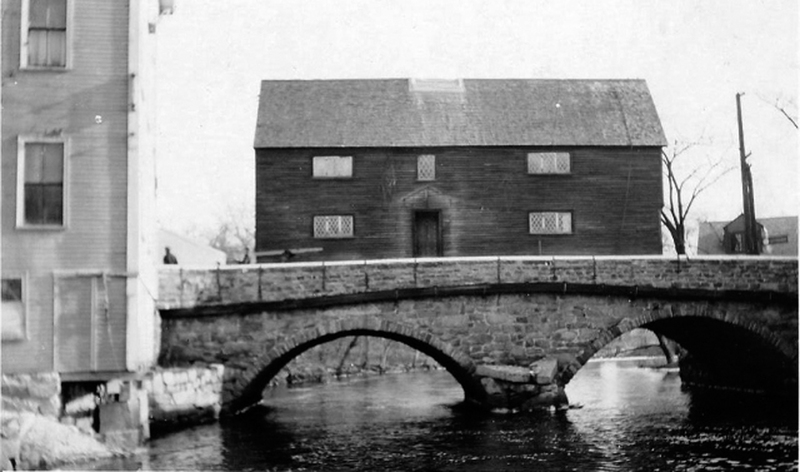 A delightful picture of the 17th century structure, squarely in the middle of the Choate Bridge, looking for all the world like it was wedged in to stay, is a particular favorite. 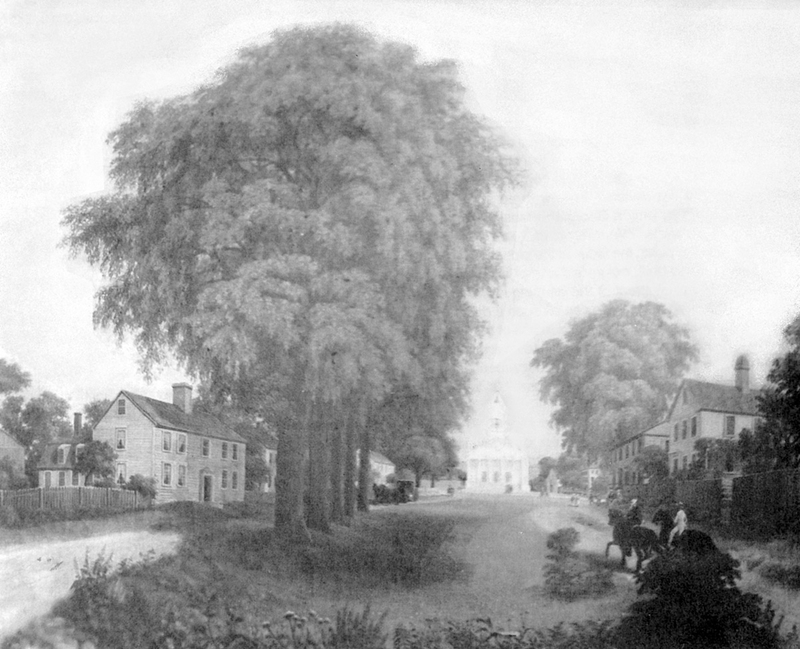 It was the building of the second Meeting House of the South Parish in 1837 that pulled the South Green into focus and finally opened up a clear view down the Green and the old Bay road. 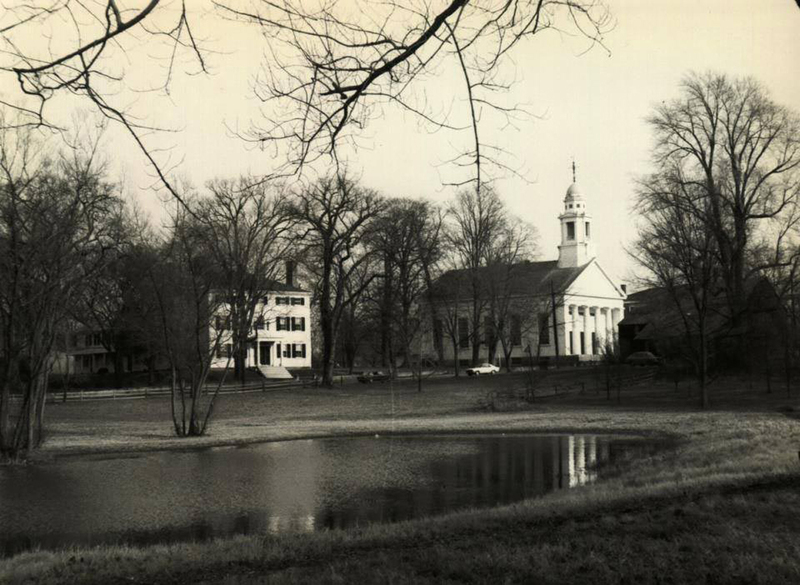 The old Meetinghouse that stood directly in front of the new was pulled down, the old Rust House moved down County Road and the 1727 Colonel Nathaniel Wade House that stood guard on the southern end of the old “trayning field” could be plainly seen. 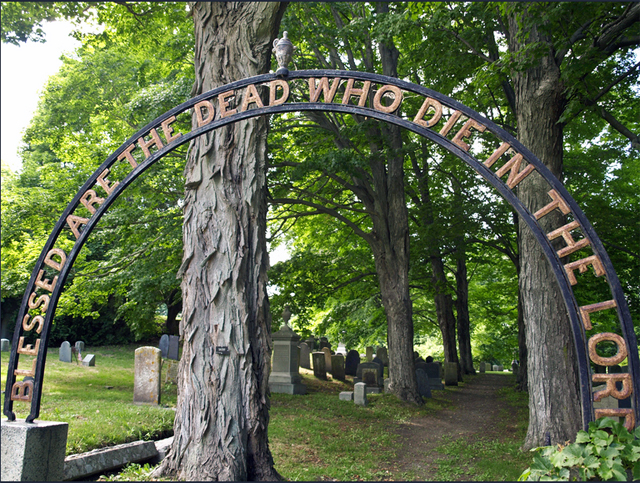 Ipswich Old South Cemetery - The Old South Cemetery has approximately 1000 interments, and was used from 1756 till 1939. 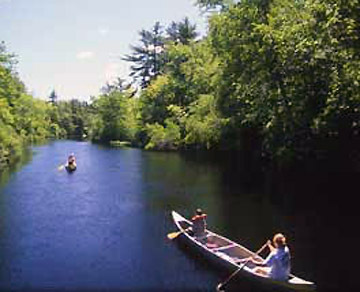 It sits between the South Green and the Ipswich River and is an easy walk from downtown. This comprehensive list of interments was created by the WPA. 57 South Main Street, Ipswich Mills boarding house (1876) - The building at 57 South Main Street was erected by the Ipswich Mills Corporation for use as a boarding house. 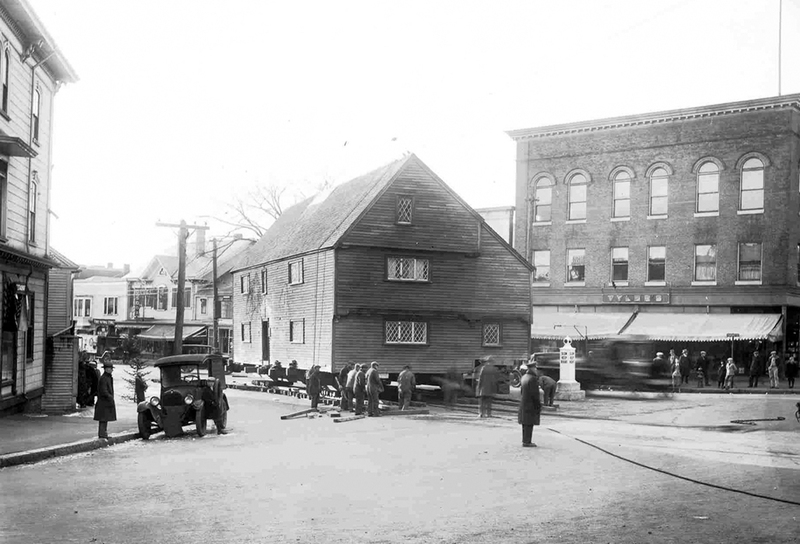 In the early 20th Century, Madeline Linehan operated the Ipswich Mills Tea House in the building. 66 County Road, the Southside Store (1835) - The South Green also had a grocery store for many years. Originally known as the Goodhue Grocery, in the 20th Century it was called the South Side Store. The store closed in 1980. 79 County Road, the Kinsman house (1820) - The house was built in approximately 1820, and was moved back on the lot when the Verizon telephone company building was constructed in the 20th Century. 70 County Road, the John Hayes house (1910) - The hip roof , the generous front porch and extended eaves of this 1910 house draw from the Arts and Crafts architectural styles of the early 20th Century. The Hayes Tavern at Depot Square was known as the Hayes Hotel in the mid-Twentieth Century. 96 County Road, Old South Church Parsonage (1860) - This charming small house with elaborate Italianate trim was built in 1860 as the parsonage for the South Congregational Church, which was at the head of the South Green. The church burned in 1977. The Rev. Thomas Franklin Waters and his family lived in this home. 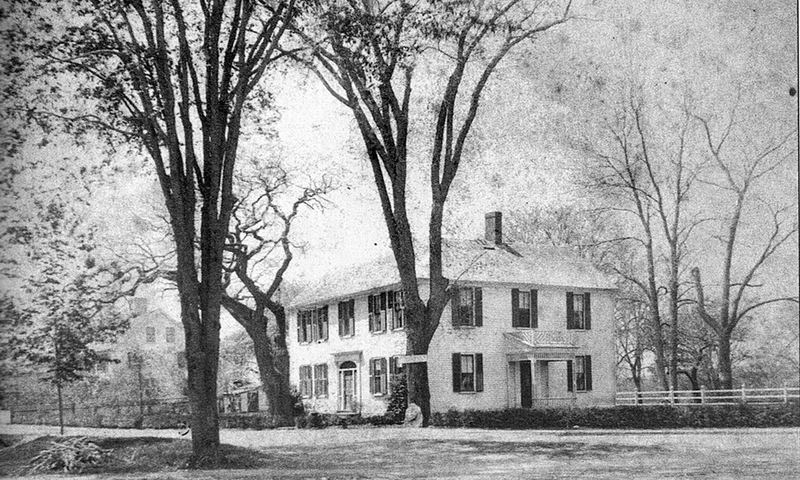 16 Elm Street, the Baker – Tozer house (1835) - Samuel S. Baker, active in real estate, bought the lot at 16 Elm Street and built this house in 1835. He sold it to shoemaker William S. Tozer (1804-1860) in 1841. The house is said to be three combined structures, one having been moved from a different location. 37 South Main Street, Baker’s Store (b. 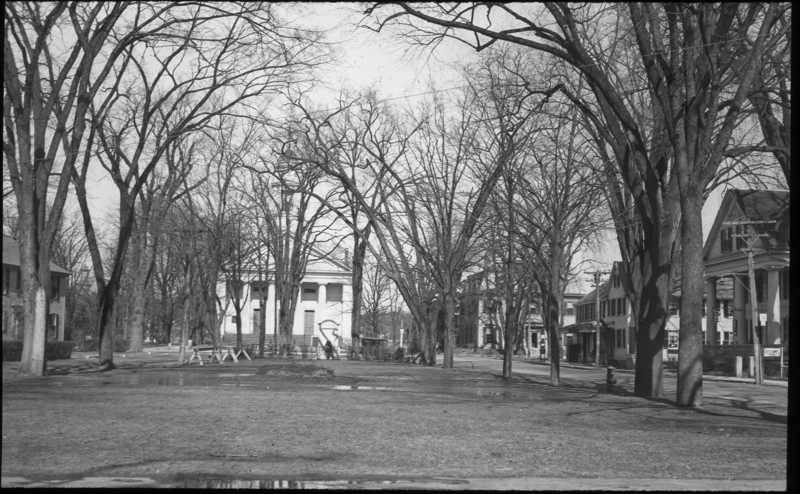 1828) - The former Baker's Clothing Store at 37 South Main Street was built in 1828. 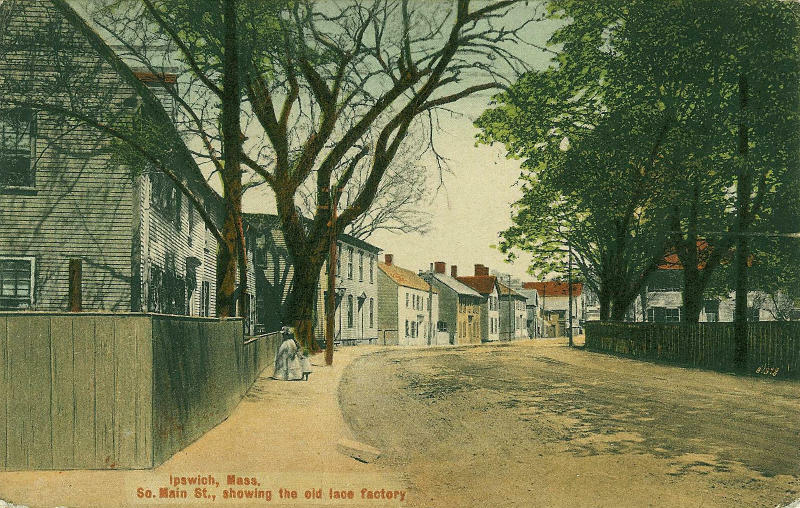 Properties along the river side of South Main St. were granted in the late 17th Century to establish businesses along the corridor where people entered the Ipswich. 11 South Village Green, the Gables (1838) - This house was designed by mathematician David Baker as an upscale lodging for lawyers in town for the Ipswich court. He was unable to repay the money he borrowed from Augustine Heard, who took possession. In the 1920's Nellie Huckins purchased the house and ran the Gables Tea Room. 1 South Green, the Captain John Whipple House (1677) - The oldest part of the house dates to 1677 when Captain John Whipple constructed a townhouse near the center of Ipswich. The Historical Commission moved it over the Choate bridge to its current location and restored to its original appearance. The Ipswich Museum - The Museum provides tours of the First Period Whipple House and works by nineteenth-century Ipswich Painters including Arthur Wesley Dow. 59 South Main Street, the Philomen Dean house (Old Lace Factory) (1716) - Dr. Philomen Dean bought this lot in 1715 and built a house. After various owners, the building was sold to the Boston and Ipswich Lace Co. in 1824, and an addition was built. In the late 19th century the building was used by as a tea room. 85 County Road, the John Wade house (1810) - The John Wade house was built at the far end of South Green in 1810, but was moved further down County Road in 1948 to make room for the South Green Burial Ground expansion. This house bears remarkable similarity to the homes of housewrights Asa Wade and Samuel Wade, both still standing in their original locations on County Rd. facing the South Green. 78 County Road, the Samuel Wade house (1831) - In 1831, Samuel Wade purchased a lot and built this house as his home. In the early-mid Twentieth Century, the Samuel Wade house became the Southside Nursing Home, with 20 rooms & 13 bathrooms. It was restored as a private residence by the Marchand family, who made it their home in the 1960’s and 70’s. 76 County Road, the Asa Wade house (1836) - Asa Wade, original owner of the South Side Store, bought this property in 1831 and built a house. This building was once identical to house next door, which was built by Samuel Wade, who may have built both houses. The house is front-gabled, but is trimmed with Federal motifs. 72 County Road, the David Giddings house (1828) - The site of the David Giddings house was bequeathed by Jonathan Wade to his grandson Nathaniel in 1749. In 1828 Wade sold the lot and the shop standing on it to David Giddings, who enlarged it to a two-story dwelling facing the Green. 7 South Village Green, the Col. John Baker House (1761) - Daniel Rogers sold his homestead to John Baker in 1761 and Baker built this house, which has much original material, including Georgian paneling and original fireplaces. This house is protected by a preservation agreement with the Ipswich Historical Commission. 69 S. Main Street, the Samuel Dutch house (b 1733) - Samuel Dutch bought this land in 1723 and built this house by 1733. The front appears to have been enlarged with a third floor and a hip roof during in the early 19th Century. The rear wing has a chamfered summer beam, suggesting that it was an older house. 57 South Village Green, the Aaron Smith house (1776) - Aaron Smith married Lucy, the daughter of John and Eunice Baker next door. A metal worker, He produced bayonets for the Revolutionary War. The clocks he produced are highly valued. 83 County Road, the Rogers-Brown-Rust House (1665-1723) - The house at 83 County Road is believed to be three houses joined together, at least one from the First Period. In 1836 the house and lot were conveyed to the South Parish as a church site. 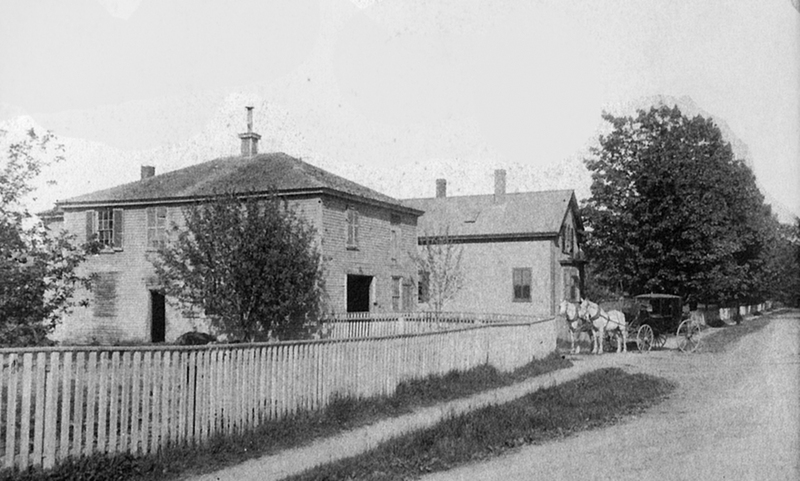 Asa Brown bought the house and removed it to its present location. 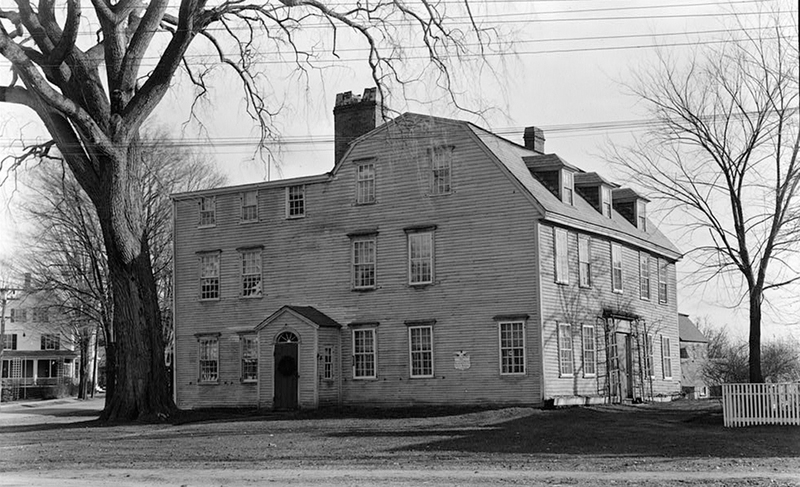 2 Poplar Street, Swasey Tavern (1718) - John Ayres built a house in 1693, and sold it in 1705 to John Whipple, who did extensive alterations. In 1725 Increase How purchased the "good mansion house” from Whipple and ran an inn. In 1789 President George Washington addressed the citizenry from these steps. It was owned by General Joseph Swasey in the early 19th Century. 36 South Main St., the Hall-Haskell House (Ipswich Visitor Center), 1820 - The Ipswich Visitor Center is located in the Hall-Haskell House on South Main Sreet.. Open weekends in May, seven days a week Memorial Day through October. 1 Turkey Shore Road, the Burnham-Patch-Day house (1730) - This house has a preservation agreement with the Ipswich Historical Commission. The house was built by Thomas Burnham in 1730 on the foundation of the earlier house he bought in 1667. 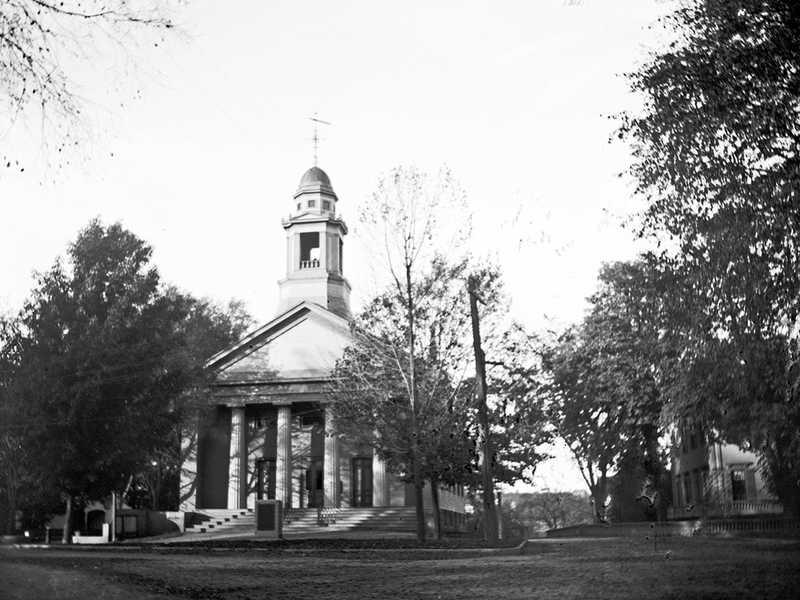 The large ell on Poplar Street was added in the early nineteenth-century. 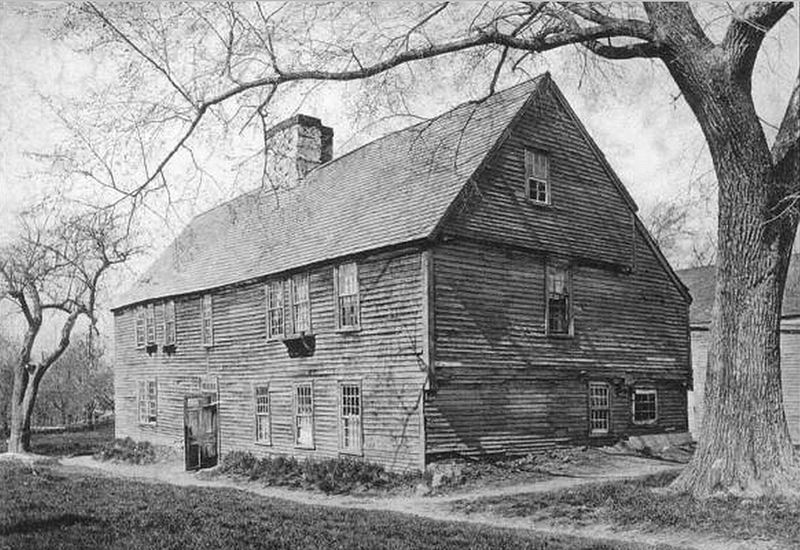 Abner Day bought the house of the heirs of John Patch in 1814 and kept a well-known tavern. 2 Turkey Shore, the Heard – Lakeman House (1776) - Nathaniel and John Heard bought this land in 1776 and built the present house. Nathaniel sold the house to Richard Lakeman III in 1795. The house was added to the National Register of Historic Places in 1980, and has a preservation agreement with the Ipswich Historical Commission. Houses and businesses bordering the South Green National Historic District on South Main, Elm and County Streets but which are not included in other historic districts are added to the map below. 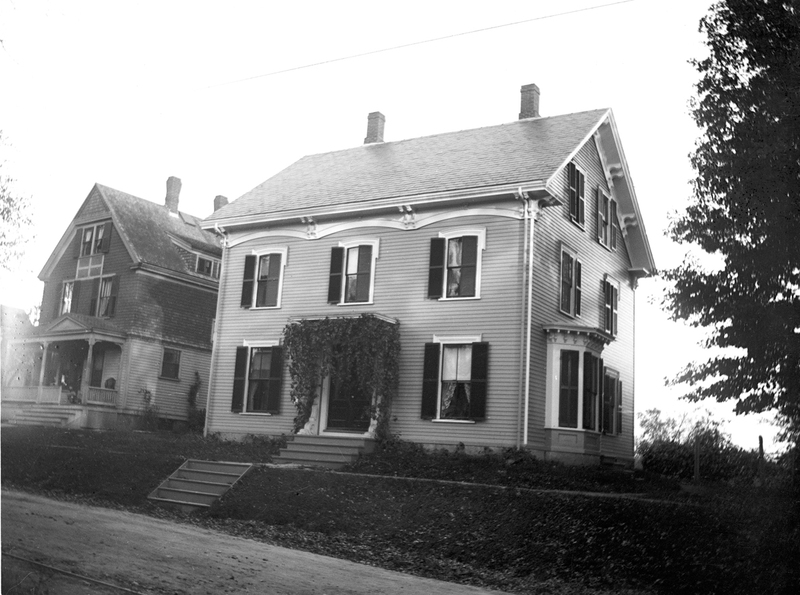 The Wally-Dana house, which once sat between the Baker and Whipple houses. 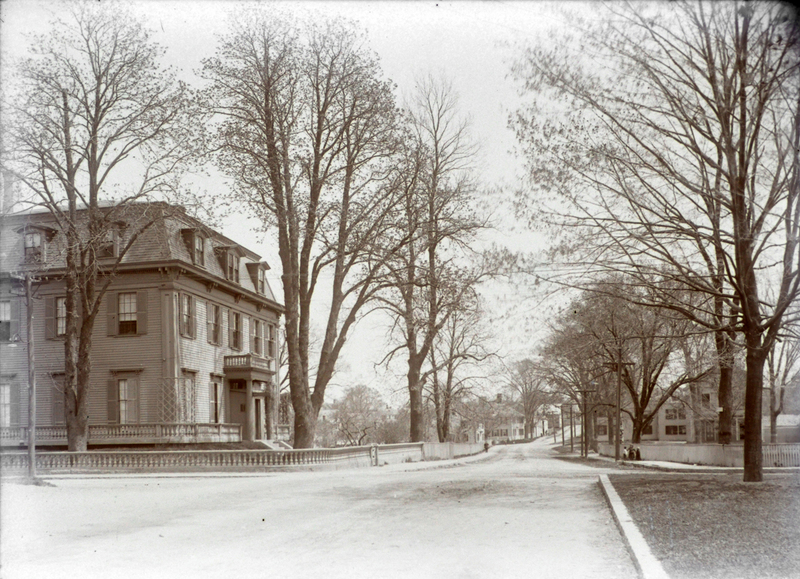 The Whipple House, before 1900, at its original location on the corner of Market and Saltonstall Streets. 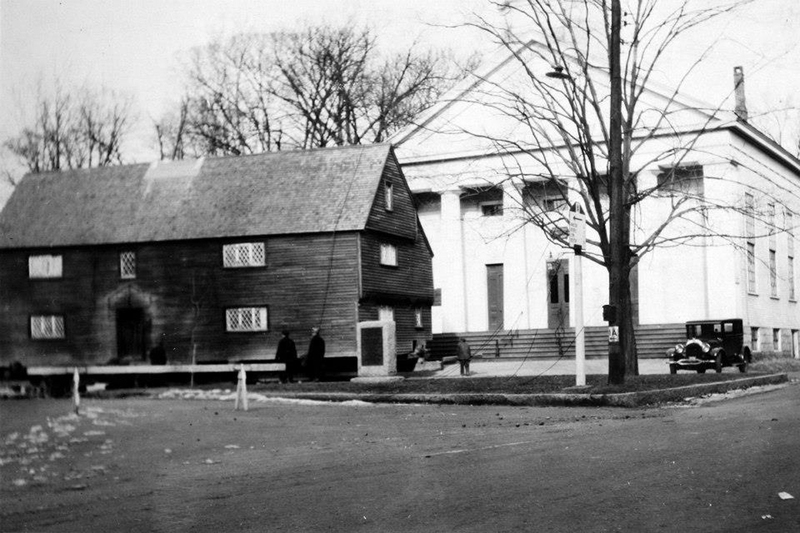 The Whipple house is parked in front of the South Congregational Church after being moved from the corner of Market and Saltonstall Streets. 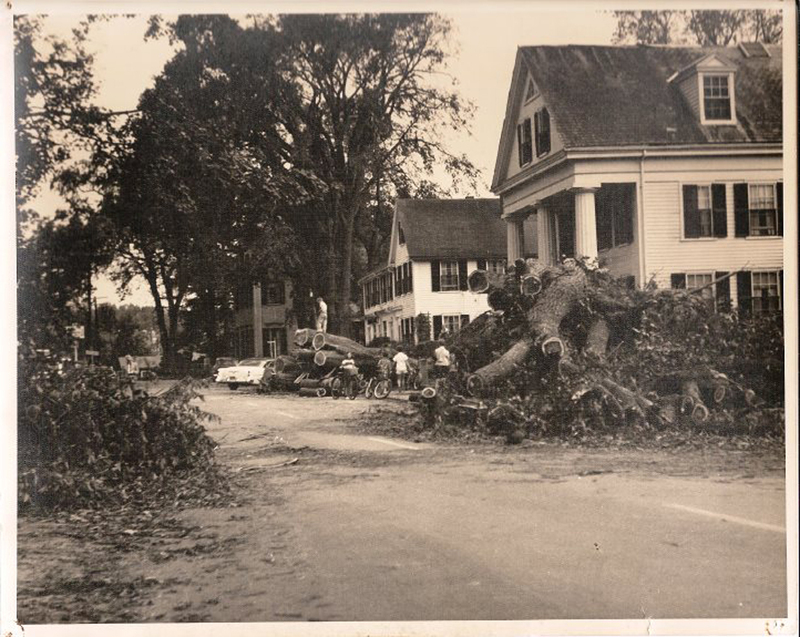 Downed elm trees in front of :Locke’s Folly” during the 1954 hurricane.